I want to share with you our tradition; yours and mine, and, as so often with transferring tradition – I will begin with a story. When I went to Yeshivat Dimona after high school I was swept up in the atmosphere of intense intellectual pursuit of Talmud Torah. Like many others, I was amazed at the breadth and depth of Torah that was suddenly revealed to me. I took my learning very seriously, spending as much of my waking hours in the Beit Midrash as possible and reducing my sleep hours to as few as possible. I remember calculating to make sure I spent a minimum of 12.1 “net” hours a day learning so as to ensure the majority of every day was spent in actual Talmud Torah. Most days it was significantly more than that. Life in yeshiva brought with it more than just the intellectual pursuit, of course, transforming different aspects of my identity. One of these was the negation between what I had grown accustomed to at home and what I was learning in Yeshiva. When learning הלכות בשר וחלב I became familiar with the discussions of the various customs of waiting between meat and dairy. I learned that although Halacha recognizes that there are many customs covering everything from 1 to 6 hours, the majority of אחרונים hold that one should wait 6 and as the מהרש”ל states bluntly: “כל מי שיש בו ריח תורה ראוי לו להחמיר להמתין שש שעות” – “Anyone who has an odor of Torah – it is appropriate that he wait 6 hours”. As one who was taking his Torah learning and observance extremely seriously (for what felt like the first time in my life) it was clear to me I would begin keeping 6 hours. I made sure to accept this new stringency בלי נדר, thus keeping the door open for myself if I found myself in a שעת הדחק or accidentally was עובר on my new commitment. I decided not to tell my parents I was changing our custom of keeping only 4 hours as, out of respect, I didn’t want to insult them or give them the feeling that I thought what they were doing was “not good enough”, a sentiment which was verbalized by them on other occasions in similar contexts. On the Shabbatot I was home (which weren’t many, as I tended to remain in Yeshiva also during “off” Shabbatot) it was easy enough to conceal the fact that when everyone else was having milk products during סעודה שלישית I was keeping to the Parve foods. This is only one of many areas in which I adopted different standards than those I had seen in my house since childhood. The justification I gave for this was that although my parents weren’t malicious in any way, they were “unaware” of the standards the Halacha set, or, were fulfilling a more basic standard and I wanted to hold myself to a higher one. These attitudes may or may have not been explicitly expressed but were unquestionably implicit when raised in discussions with our rabbis. Once Ema and I got married it was even less of an issue as I found myself in such situations, of a difference in standards of observance between myself and my parents, even less. This split, between my family tradition of keeping 4 hours, and my following the מהרש”ל persisted for 14 years. And then we moved back to Efrat; more specifically, to the house in Rimon right near my parents. As Matanel was beginning to get older and approaching the age of 6 which is גיל חינוך I began to reconsider things. I remember a specific Shabbat when my father, Matanel and I were all sitting next to each other in the upstairs Shul and I suddenly felt the meaningfulness of having the 3 generations sitting together in Shul and out of nowhere the following thought struck me – ‘what do I say to Matanel when HE discovers that he keeps more hours than his Saba and Savta? what do I tell him when he asks me why they only keep 4 hours between milk and meat and he keeps more than that’? Any answer I’d give him (and eventually all of you) would carry with it a break in the tradition – as the 4 hour tradition goes back, at least, to your grandfather’s grandfather – giving you the message that your observance is dependent on books, more so than on a living tradition. My next thought was one which turned my world upside down – ‘Which holds more power, more depth, more truth, more religious certainty – a life which is motivated by what you will read in a book or one which is motivated by continuing age old patterns’? Put otherwise – what would you, my children, gain from being מחמיר to hold 6 hours vs. what would you be losing? you’d gain that you would מקיים the statement of the מהרש”ל and would act as “someone who has an odor of Torah” but you’d lose your trust in your traditions. You’d lose your trust in the fact that “this is who I am because this is what my father and grandfather and great grandfather did” . When wondering “Why am I religious?”, or, “Why do I keep Mitzvot?”, which holds more merit as an answer: “because I read it in a book / I heard a great explanation from Rabbi X about it”, or, “This is what I’ve always done, this is what my father, grandfather and great grandfather did. This is what Jews do because this is what we’ve always done”? Soon after, I switched back to 4 hours myself and all of you have never known anything else. This has caused me to re-evaluate all of the changes I’ve adopted over the years as a result of thinking my parents and grandparents weren’t following Halacha and wherever I can find a reputable opinion to סומך on, even if it is a דעת יחיד, I’ve returned to the customs of my family*. This may sound odd, it may sound extreme but I truly believe it is the essence of what our tradition is about – tradition itself, as a living entity, not words in a book. 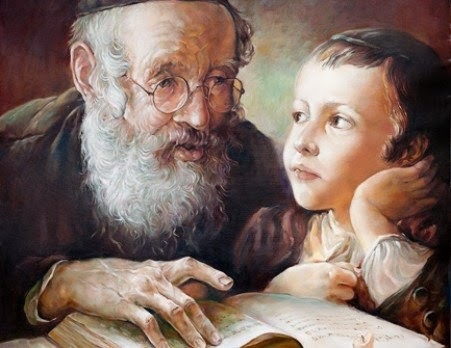 This is how I understand Talmud Torah which, in the Torah itself, appears as a conversation between generations, between “father” and “son”, not from teacher to student. This is because Torah isn’t “information”, “ideas” and “behaviors”, rather, an identity, which can also be expressed through all these but they are not what Torah is. When Jews began to lose their identity, to forget who they were, the chain of tradition was broken and the only way to retrieve it was to start talking about it, intellectualizing it and anchoring it in books as there was nothing else for the wayward ship of Jewish identity to hold on to. Fortunately for us, though, this is not the case for our family. On both sides of my family – the chain has never been broken. When you hear people say – as I myself said so often in previous years – “why is there a contradiction? you can love and respect your parents and grandparents and still be more מקפיד than them”, or the famous use of “בכל מתקנא אדם חוץ מבנו ותלמידו” to denote that just like parents are more than happy to see their children become wealthier than them they are (or should be) happy to see them become better Jews than them (whatever “better” means). To that I say, חז”ל tell us “לעולם יאמר אדם מתי יגיעו מעשי למעשי אבותי”. This is not to say, necessarily, that all of your actions will not be as good as those of your ancestors, rather to say that you should live with that mindset, that your actions are an effort to להגיע – reach back to, and be a continuation of, the actions and way of life of your ancestors. I think Chazal are telling us that we must have this mindset, possibly even regardless of how they actually led their lives, as it is crucial in creating the traditional persona. Luckily, in our family’s case, we don’t need to make believe. I can only wish to one day achieve as meaningful a Jewish life as them! to think I can do more than that is, in my mind, tremendous vanity and to think I can do so by breaking away from the traditions and continuity that have brought me to this point to begin with, seems ludicrous. What value could there possibly be in breaking the chain which defines you as a person and as a Jew, that which connects you to the eternity of Torah and tradition? Now I come to the most important part of giving over our tradition to you. I’d like you to know a bit more about your ancestors. And I want you to pay close attention as they and how they lived their lives play no less a role in making me the person and Jew I am than the אבות and אמהות themselves. And just as the stories of the אבות are Torah – so are these stories of your אבות. Indeed, the whole point I am trying to make is that they are not, and cannot, be different stories. They are the same long story. At least in our family. What I can share with you, at the moment, are the memories I have of my grandparents and I will begin with Zayde Yitzchak. You have heard stories – of how he was orphaned from his father at a young age and how, when arriving in America in 1898 when all other Jews were working on Shabbat, he, a young man of 18 refused to do so. It is difficult these days to understand how difficult and unusual that was and wonder where he got the fortitude and conviction to do so. You’ve heard how he became wealthy in Cleveland and how his house was a center for Rabbis, Admorim and Shluchim from Israel and Europe who all knew that when you came to Cleveland – you stayed with Reb Yitzchak Feigenbaum. You’ve heard how Zayde Yitzchak was one of the few Jews in Cleveland who had a Sukka and how that resulted in the connection with rabbis Bloch and Katz to whom he eventually gave his house to restart Telz Yesihva in 1941 after it was dissolved at the beginning of WWII. You’ve heard of his tremendous הכנסת אורחים, his deep commitment and involvement in Jewish organizations, first and foremost with Mizrachi. You’ve heard of the singing at the Shabbat table and you’ve heard about the emphasis he put on family. You’ve heard me boast that every one of his 7 children stayed observant as well as 21 out of his 23 grandchildren. You’ve heard my story of finding his Sefarim on תשעה באב in Camp Stone and you’ve heard – and read – Zayde Yitzchak’s ethical will. Read it again and again and again as it is part of who you are. Unlike Zayde Yitzchak, who I never met personally, my Zayde – Moshe Aharon Feigenbaum, I did know. I have many memories from him but the ones that are most vivid in my mind are those of him going to Shul every morning in Cleveland (after his early morning shower) and how, even after his stroke in Israel, he put on his Tfillin every morning and went to Shul every evening for Mincha and Mariv. I was lucky enough to push him in his wheel chair to Shul on occasion, though I now wish I had done so more often. I remember how so often he would break out in a lively ניגון he remembered from his childhood when Rabbis and Admorim visited his father and wondering to myself if there is any other Jew who even know these tunes as so many of them were lost during the war. I remember his stories of WWII while serving in the US navy, and that due to the fact that he wouldn’t eat the Treif meet he received in his rations, he would give – or trade – it with his fellow soldiers. I remember how, albeit his tremendous will to make Aliya over the years and almost not making it – eventually he did. I helped them pack up their house in Cleveland when the movers came. I remember how seriously he took his Ulpan studies, sitting at his kitchen table in the house in Efrat doing homework, sometimes even with the assistance of his 6 year old grandson. I feel tremendous pride, to this day, that whenever I meet a Cleveland old timer and tell them I am a Feigenbaum they immediately respond – “Pshhh, you’re Moish Feigenbaum’s grandson? do you know who your Zayde was?…”, continuing to tell me of his involvement with Mizrachi, Bnei Akiva, the Mikve association,Beit Sefer and numerous other community organizations. Bubby – Sylvia (Chana Sarah) Feigenbaum I had a chance to spend even more time with, as she survived Zayde by 9 years. Bubby was the most accepting and non judgmental person I’ve met. I remember how at ease I could be with her, how comfortable she made me, and everyone else around her, feel. I remember how Ema and I lived with Bubby for half a year while I learned in Machon Meir, the degree to which she took care of us and made Ema truly feel part of the family. I cherish the memory of the evenings the three of us spent playing cards and hearing stories of the old days – her life as a child, how even as a young women she too refused to work on Shabbat and was able to convince them she could fulfill all her duties in one less day a week (she was very proud of the fact that she had an education). I remember her stories of how after she and Zayde got married they traveled all over the country as part of his military service and how once she had to go to the ocean with a friend, instead of a proper Mikve, as there was no other option available. I remember her optimism and positive outlook and how, after suffering so many losses in such a short span of time – Zayde, uncle Hye (her brother) and Doda Leah, still didn’t lose her optimistic and positive approach to life. She, too, was involved in the larger Jewish community both in Cleveland as well in Efrat. You can hear a lot more about her from her, herself. Bubby and Zayde had 4 children and 14 grandchildren who have all followed in their footsteps; are good, moral people, leading meaningful family lives, committed to a life framed by Torah observance while deeply engaged with the world and contributing, each in their own way, to the betterment of עם ישראל. 7 of their grandchildren have served in either the IDF or the Israeli National Service. Their (so far) 29 great-grandchildren are all growing up in loving homes where Menschlechkeit, Torah and Jewish education are at at the center of their lives. 10 out of their 14 grandchildren and 17 of their 29 great grandchildren live in Israel and continue to be affiliated with Mizrachi, to whose ideals they devoted so much of their lives. On my father’s side the dynamic was very different. My Savta – Ita Spitz – I didn’t know, as she passed away several years before I was born and I don’t remember too many stories about her. They came from a very different culture, one that was harder for me to relate to and understand. My Saba – Yechiel Spitz – on the other hand, was part of my life for many years. I remember, when I was young, going with him the Shul on Shabbat morning to the tiny, crowded, Gerer Shul, wondering why he would choose to daven there. Years later, when researching the background of our family I discovered that the town my Sabba was from – Bereksaz – was a Chassidic town which accounts for some of our Chassidish customs. I remember our frequent visits down to Arad, which as a child seemed to be at the end of the earth, eating traditional Hungarian foods, playing cards, going to the pool across the street and listening to music in the park during the annual music festival. I remember his extreme humility, never ever talking about himself, only wanting to hear about us and encourage us to be successful in life. I remember how every time I left his house, be it when I was 5 or 25, he would always stuff some money in my hand or pocket, even though his lifestyle seemed as humble and simple as can be. I can’t remember leaving his house without bags of food in my hands. I remember how every time we’d accompany Sabba to the cemetery in Arad, he’d bring a rag and small bottle of water and how meticulously and lovingly he’d clean Savta’s gravestone. We never offered to do it for him because it was clear he felt it was his responsibility, his task of devotion to her. I remember hearing glimpses of his story from the war from the women I grew up calling Savta – Hadasah, Sabba’s second wife – and being amazed at his perseverance, being in several camps and then – somehow – ending up joining the Russian army to fight back against the Nazis. To go through that, build a new life – several times – and stay so humble and so focused on other people, is hard for me to comprehend. Saba and Savta had 2 children and 7 grandchildren who are all leading Torah driven lives, many of whom are heavily involved in Chessed, lay leadership, the rabbinate and Chinuch and all of them, driven by a similar sense of persistence and forbearance. They have 32 great-grandchildren, all growing up in environments of a love for family, tradition and Torah. 23 of the 32 are growing up in Israel. Regarding mine and Ema’s parents – your Sabbas and Savtas – there is a lot of Torah to tell of them as well. But, thank Hashem, there is plenty of time for you to create your own memories of them, of how they live their lives, their impact on their families and communities and what role they play in your life and identity. So, there you go – this is a glimpse of where you come from. These stories are part of our family’s Torah. Together with these Torahs come a world of beliefs, ideals, customs and behaviors. They are all part of your מוסר אביך ותורת אימך. They should fit in, perfectly, with the wider concept of Torah as, in our family, there was no break in the chain. The same parents that raised me as a Shomer Shabbat raised me to be someone who sings at the Shabbat table. Those 2 elements play just as important a role in what Shabbat means to me. The fact that Halacha defines them as having extremely different Halachik “weight” makes no difference in that regard. You are a result of the lives and deeds of these people. Whether you realize it or not, you are comprised of, and bound to, both the physical and spiritual DNA of these people. Look at them, their lives and their stories – and you will find yourself, what else could you possibly hope to find? * If there is anything you see that we do at home that you think is inconsistent with Halacha – come and ask and I will explain whose opinion we are סומך on in order to keep our link to our אבות intact and complete. ** Do not think, for a moment, that I don’t at the same time believe in an individual connection to Torah, or in the ability of Halacha to be dynamic and even revitalized, especially now that we’ve returned to a national life in Israel. (As I like to say – “Now that the nation has come back to life – it is possible for Torah to do the same” by rediscovering its vitality as well as its pro-active creativity). Going through some of the other pages of this very website will demonstrate to what degree I believe that. Even so, there is no contradiction. In fact, quite the opposite. Only a Judaism which is based on live traditions and mimetic behavior has the ability to change, transform and develop in a natural way. Happened to come across your letter. Maybe I read it too quickly or superficially, but is it really true that the minhag in Bereksaz was to wait 4 hours? You mention Bereksaz as the origin of your father’s side of the family and you also say that your family mesorah was to wait 4 hours. I have found out that it is not an uncommon Hungarian custom.